Graphite beneficiation process/ graphite purification plays an important role in the mining industry, JXSC provide a full set of graphite beneficiation processing equipment. Graphite ore is one of the minerals of elemental carbon crystal, has excellent properties such as lightweight, high-temperature resistance, thermal conductivity, electrical conductivity, lubrication, plasticity and chemical stability. Graphite is widely used in aerospace, new energy, medicine, information technology and high-end equipment manufacturing. Emerging industries such as energy conservation and environmental protection, the nuclear industry and new materials will become important strategic resources to support the future development of high and new technology. Graphite flotation is commonly used for purifying graphite minerals. Because the graphite surface is not easily wetted by water, it has good floatability and is easy to separate from impurity minerals. In China, the flotation method is basically used for graphite ore dressing. The flotation of graphite ore is generally carried out by positive flotation followed by reverse flotation of the flotation concentrate. A higher grade graphite concentrate can be obtained by flotation. Flotation graphite concentrate grades can usually reach 80%-90%, using multi-stage grinding, the purity can reach 98%. The scale graphite flotation process is generally a closed-circuit process of multi-stage grinding, multi-stage sorting, and medium-mine order (or centralized) return. There are three forms of multi-stage processes, namely re-grinding of concentrates, re-grinding of mines and re-grinding of tailings. Crystalline graphite is mostly used in the re-grinding process of concentrates. Under normal circumstances, the recovery rate of mineral processing operations can reach about 80%. Some mines have also tried the re-grinding process in the mine, but the effect is not obvious. Some small factories also use open or semi-open flotation processes. Due to excessive disposal of tailings, the ore recovery rate is very low, generally only 40%-50%. (1) Shangdong South Villa Graphite Mine. The mine is located in Laixi County, Shandong Province, producing flake graphite. The ore processing capacity of the ore dressing plant is about 350,000 t/a, the original ore size is -450 mm, the grinding grain size is -15 mm, and the selected grain size is -0.15 mm, accounting for 60%-65%. The ore grade is 4.39%-4.45%, the concentrate grade is 88%-89%, the recovery rate is about 80%, and the tailings grade is 0.6%-0.8%. The flotation concentrate is purified by the alkali-acid method, and the final graphite concentrate grade is 98%-99%, and the operation recovery rate is 88%. (2) Inner Mongolia Xinghe Graphite Mine. The two plants have an annual processing capacity of 300,000 tons of raw ore and a graphite output of about 7,000 tons. The original ore size is -350mm, the grinding particle size is -10mm, and the selected particle size is -0.15mm, accounting for 38%. The ore grade is 3.82%-4.07%, the concentrate grade is about 88%, the tailings grade is 1.34%-1.68%, and the recovery rate is about 68%. Flotation concentrates can be chemically purified to a grade of 94% to 99.5%. (3) Heilongjiang Liumao graphite mine. The mine produces flake graphite. The original ore size is -550mm, the grinding grain size is -20mm, the selected grain size is -100 mesh, 70%, the ore grade is 14%-16%, and the graphite coarse concentrate after flotation is re-grinded 5 times and 6 times. The selected and medium-concentrated concentrates are returned to the rough grinding circuit, and the obtained concentrate grade is 93%-95%, the tailings grade is 3%-4%, and the ore dressing recovery rate is about 75%. (4) Hunan Lutang graphite mine. The mine produces cryptocrystalline graphite. The ore grade is 65%-68%, the particle size is -250mm, and it is fine-grained. The graphite processing flow is relatively simple, and is mainly composed of processes such as hand selection, coarse crushing, screening, medium crushing, drying, grinding, and classification. The graphite ore processing capacity of the ore dressing plant is about 60,000 t/d, and the grinding grain size is -40 mm. The hand-selected concentrate grade is 70%-88%, the hand-selected tailings grade is less than 60%, and the ore dressing recovery rate is 90%. JXSC shares graphite beneficiation processing flowsheet and graphite plant design diagram. Graphite purification process research has a good effect of other mineral beneficiation process like chromite mining process. 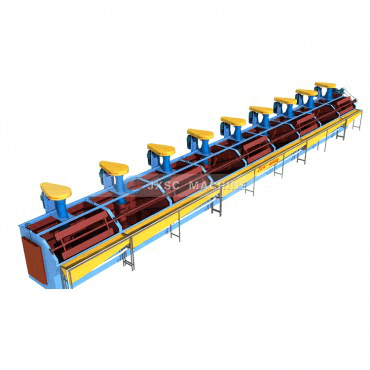 contact us to know the crusher machine price and flotation price and so on mining equipment.